Each fall high school seniors around Northwest Missouri apply for the prestigious Cotillion for Achievement scholarship. Out of hundreds of applicants, sixteen are chosen as finalists for two $1800 scholarships that are awarded in early February. 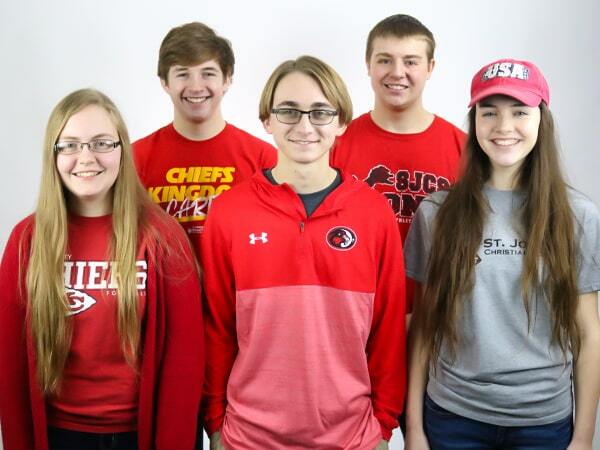 This year St. Joseph Christian had five students selected as finalists: Hannah Brown, Rachel Carlson, Jonathon Voga, Jack Weil, and Joshua Wing. The Cotillion for Achievement is a longstanding “leadership development and scholarship program, focusing on developing leadership skills, honoring outstanding high school seniors, and awarding them scholarships.” The selection process is two-fold: the initial application, then the final interview. In early October applicants submit a resume listing their actives, community service, and academic achievements, and write a formal essay in response to a prompt. A panel of judges from a variety of backgrounds review each application and select sixteen finalists, eight boys and eight girls. Finalists are announced in early December, then over the next few months attend workshops sponsored by the Cotillion “designed to enhance their leadership and social skills and to encourage extensive community involvement.” Various workshop topics include professionalism, interviewing skills, and multicultural education. SJCS finalist Jonathon Voga appreciated the multicultural workshop and that the Cotillion for Achievement brought in people from all over the world, both local and abroad, to speak to the students. The Cotillion for Achievement also has workshops dedicated to enhancing each student’s social skills and professionalism, which SJCS finalist Hannah Brown highly valued. After completing the series of workshops, each finalist then has a chance to put the skills they have learned to the test in the final interview. The Award of Distinction, valued at $1800, is announced at the formal dinner and dance for the top male and female finalist. Remaining finalists each receive a scholarship of $900. Congratulations to our five SJCS representatives on this outstanding achievement!